There are three separate story lines going on so we will simply do it one at a time. - Shuri is continuing her trip to the Djalia, which is pretty much just another vague poem like story, this time about a boy and a cheetah. I am not even going to pretend I know where this is all going. - Changamire meets with Tetu and Zenzi. He gives his criticisms of the crown and turns it into criticisms of The People as well. Basic gist is they are no better, if not worse. Tetu basically admits as much at the end. They have gone full heel. 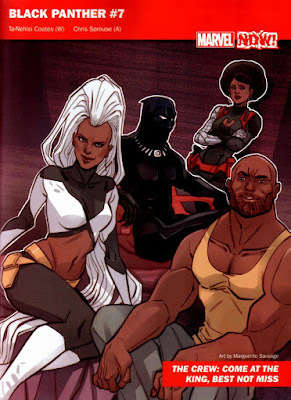 - The Crew/T'challa part of the story was basically shown in the preview. A few fisticuffs, T'challa gets the better of Stane even with his hands tied behidn his back. Stane gets away thanks to the Vanisher dude. T'challa thanks the Crew and then thanks the suicide bomber turned ally. - I am sick of the Shuri stuff. Too vague to me. Maybe it ties together in the end and on a re-read it will be better but... bleh. Waste of pages at this point in time. - The Chang/The People conversation was likely the best part of the book. I do like Changamire's realization that the People are nothing but terrorists and are certainly no better than the King. Tetu and Zenzi going full bad guy is welcomed at this point. - And then there are the Crew. The big build up was 100% wasted junk. No good interactions between T'challa and the Crew. The action was surprisingly bad and stiff both in creativity and the way it was drown. I mean, yeeesh. If they had any dreams of spinning a Crew title out of this, this issue did not help one iota. You could have replaced any group of people, including the HZ, and gotten the same effect. What a missed opportunity here... no Cage, Misty, or Storm fan is staying on the book because of this appearance. - T'challa had his best showing yet, in my humble opinion. He actually used the force push in an interesting way and was able to take Stane with his hands behind his back. Not bad, a definite improvement over previous issues.